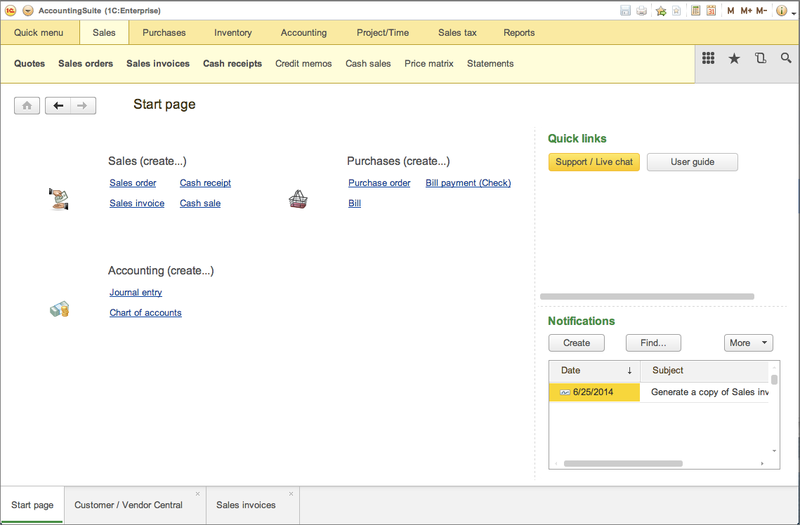 1C:AccountingSuite is a small business accounting and inventory software. The solution supports US GAAP and IFRS accounting and reporting standards. The software provides full visibility into purchasing and sales transactions, automates accounts receivable and accounts payable. 1C:AccountingSuite makes managing payments, receipts, and bank transactions a breeze, providing business owners with a real-time financial snapshot of operations. Select any user, no password required. 1C:AccountingSuite is a free business application, which is distributed “as is” and can be used as an example of a business application supporting multiple financial localizations and tax regimes developed on 1C:Enterprise 8 Platform. There are cloud-based accounting applications, and then there is AccountingSuite. AccountingSuite is a new class of cloud business finance software that intuitively integrates accounting, inventory and order management into a single application. We built AccountingSuite to be uncomplicated and compatible—out of the box—with how growing businesses operate day-to-day. We put the features you need where you need them, so they are easy to access exactly when you need them. Gives business owners and employees anytime, anywhere access to the financial data and reports they need to make day-to-day and strategic business decisions. Provides financial data for outside accountants, investors and partners. Manage all aspects of sales orders and customer service transactions. Designed to shorten your “order-to-cash” processes across all parts of your business. Stay on top of your purchasing processes with streamlined management of purchase orders, inventory receipts, vendor invoicing, and supplier refunds. Feel free to ask questions on 1C:AccountingSuite support forum.